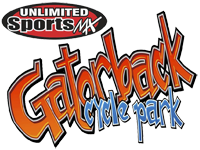 Unlimited Sports Gold Cup This Weekend, Practice Saturday – Race Sunday – Gatorback. Best 6 out of 7 races for custom overall awards and contingency. This video was filmed and edited in 2004 by DZP. Long time ago, and learned a lot since then… hahaha REWIND !! The final round of the Florida Gold Cup Series will be this weekend at Gatorback Cycle Park. The SX track will be finished and Unlimited Sports will be offering a practice session on that track along with the practice on the MX track. When you go to sign up you will be offered to practice either just the MX or just the SX for $20 each session, or you can sign up for both sessions for the cost of $30. Practice will be 9 am till 4 pm on Saturday. Church service will be at 7:30. Following Church service will be the riders meeting, then practice.